A gorgeous synthetic diamond cuff bracelet featuring two round brilliant lab diamonds surrounded by two halos, one on each end. Custom made to order to fit your wrist. Available options: platinum, 14k or 18k gold: white, yellow, rose. Our custom design process offers sophisticated guidance and curation from an approachable diamond expert. Get started today. Ada Diamonds Design Description- This sophisticated cuff bracelet features two round brilliant lab grown diamonds at each end surrounded by two beautiful halos in 14k white, yellow, or rose gold settings. Additional Description- Made to fit your wrist! 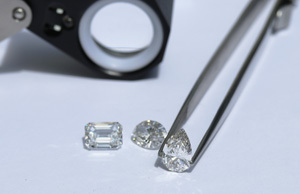 Starting at pricing assumes a matched pair of GH, SI1 lab grown diamonds set in 14kt gold. Additional fees for 18k: $150, platinum $300. All of Ada's fashion jewelry is fully bespoke and made to order. Our friendly Diamond Concierge are here to assist you in creating a unique and stunning piece of fine jewelry customized to meet your needs with conflict-free lab diamonds hand selected for quality, fire, and brilliance. Inquire to get started, or learn more about our exclusive Concierge Experience. In a hurry? Shop our hand-curated selection of ready to ship lab diamond fine jewelry, or inquire to build something custom.